The minute the sun starts shining in London, the gloomy fog over London lifts and everyone starts to feel all that little bit better. What better way to enjoy the weather than a rooftop bar with a cocktail in hand and a view to remember. Here are our favourite rooftop bars in London. If you are after a stunning view of the London skyline then the newly renovated Radio Bar on The Strand is your rooftop bar of choice. 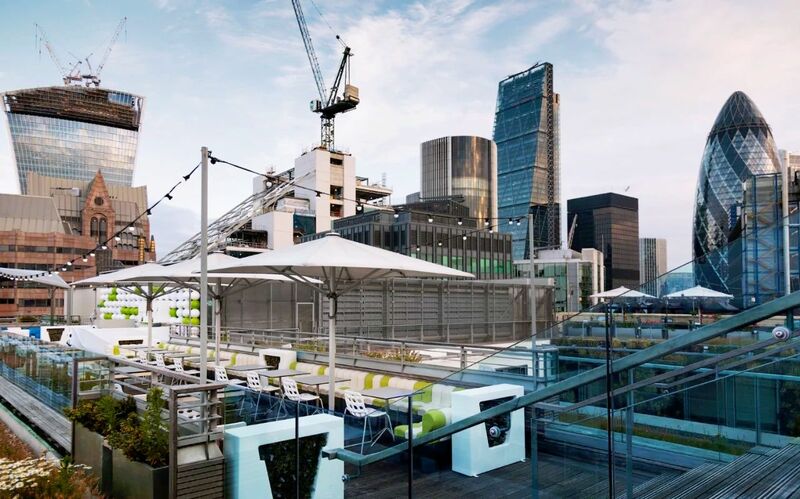 Situated 10 floors up on the roof of the ME hotel, your 360 view from the rooftop includes the London Eye, St Paul’s Cathedral and iconic buildings like the Gherkin and Houses of Parliament. It is a great place for lunch to enjoy their selection of tapas dishes or if you are feeling fancy opt for the afternoon tea selection. As evening hits, watch the sun set and choose from their cocktail and drinks menu. The bar is open till late, with late nights till 2am Thursday-Saturday. I recommend booking a spot as it can get very busy. Visit radiorooftop.com/london. Selfridges have transformed their winter Forest On The Roof restaurant into a roof deck for Summer. The Roof Deck has taken a Californian theme and you can find yourself dining at the restaurant and sipping a cocktail at the bar amongst the palms. The menu includes options such as charred monkfish, wood-fired lamb chops and spelt risotto with a very tempting lime and coconut meringue pie for dessert. The restaurant is situated on the top floor and to access The Roof Deck, take the lift on the ground floor by the fragrance hall. Visit www.selfridges.com. 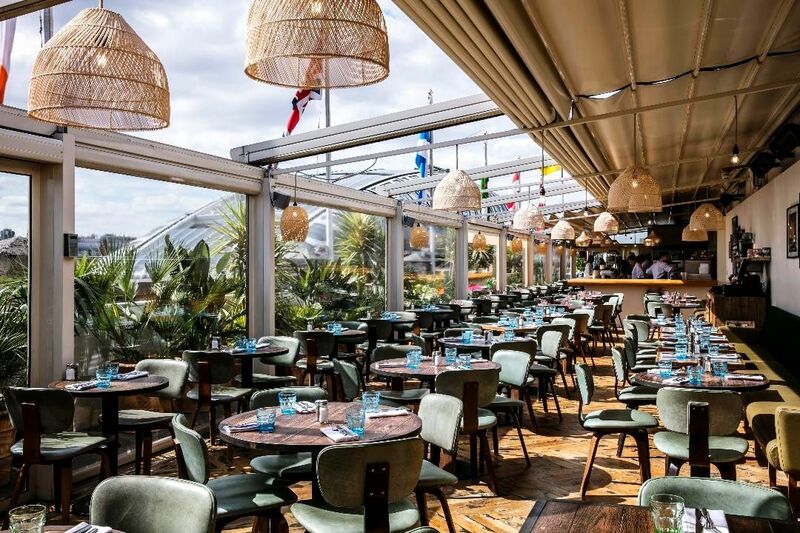 If you are in Central London, Aqua Spirit is a perfect rooftop spot. 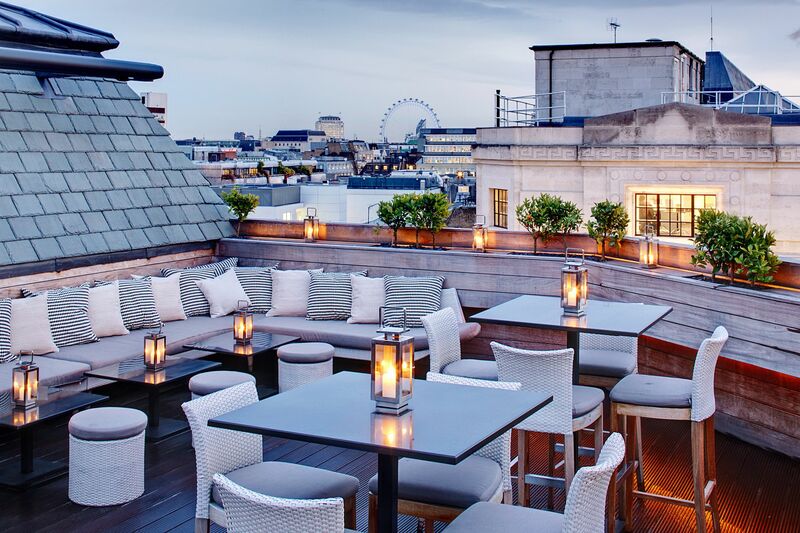 The terrace bar is located just off Oxford Street and is adjoining to the Aqua restaurant. 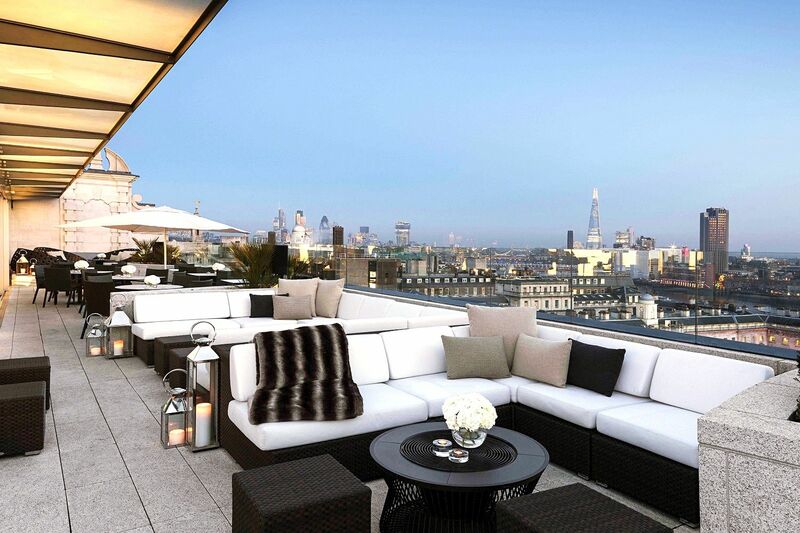 The bar overlooks London and you can spot some of London’s most iconic buildings. Aqua have an extensive cocktail menu that includes the likes of a Knickerbocker, Pampero rum, Cointreau, raspberry syrup and lime or try the Morning Glory Fizz, Johnny Walker Gold, lemon, sugar, absinthe, egg white and soda. The bar unfortunately don’t take reservations for the terrace and it is on a first come first serve basis. Lunch is served 12-3pm and drinks from 3pm. Visit aquaspirit.co.uk. 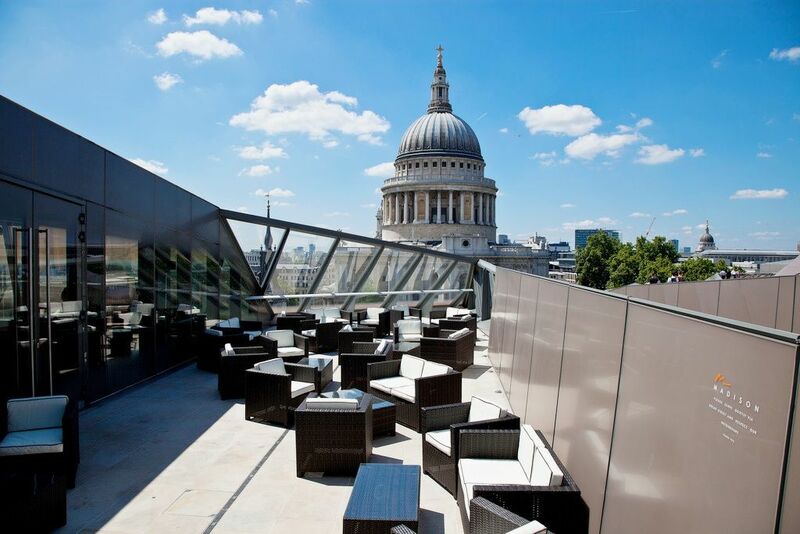 You will find Madison on top of the One New Change shopping centre near St Paul’s Cathedral. The restaurant has an outdoor bar area where you can sit and soak up the sun. They have a variety of cocktails on offer and a lovely tapas menu for food. Madison offers a great view and if you walk to the end of the rooftop you can really see over London. A great one for photo opportunities against the backdrop of St Paul’s Cathedral. Madison is open daily and again I’d advise booking, especially on weekends. Visit www.madisonlondon.net. If you are after a chilled area to relax after work, then John Lewis rooftop garden is a casual spot to do just that. Decked out by The Gardening Society it’s the perfect place to feel like your not actually in London. The garden is on the top of the John Lewis building on Oxford Street, where you can enjoy a drink from The Gardener’s Arms pub and there is also a rooftop menu of food available which includes everything from burgers to fish finger sandwiches, why not try one of Morty & Bob’s grilled cheese sandwiches. Open now until 4th September, Sunday-Wednesday until 9pm (last entry 8pm) and Thursday-Saturday closing 11pm (last entry 10pm). Find access to the rooftop on the top floor by the cafe. Visit www.johnlewis.com/content/roof-garden. Skylounge at the DoubleTree Hilton in Tower Of London offers one of the best views across London. The bar has an indoor area and an outdoor setting for those lovely summer days. The bar is located on the 12th floor of the hotel and offers you a 360 view across London, enabling you to take in all the sights. Visible landmarks include The Shard, Tower Bridge and St Paul’s Cathedral. Skylounge serves lunch and dinner, as well as a brunch on weekends. Brunch is served every Saturday and Sunday between 10.30am-2pm offering a three course menu for £18 or a choice of dishes that include a short rib beef burger and pancakes. Open daily and booking is advised. If you aren’t too fussed about being outside but would like a spectacular view, then also check out SkyGarden London. Have you got a favourite rooftop spot you’d like to share? 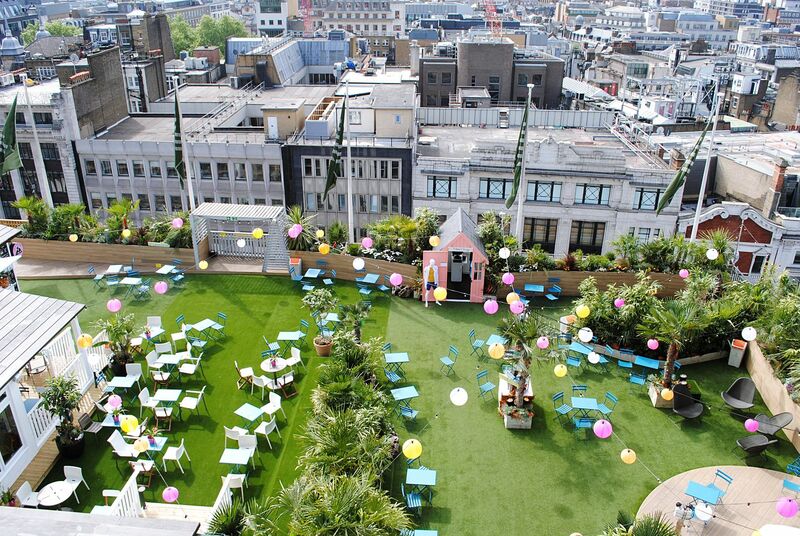 I loved the rooftop at John Lewis last year, so glad they’ve brought it back for this summer! Radio Bar is my absolute favourite rooftop bar. The panoramic views of London are magnificent particularly during sunset. Premium prices for cocktails but nothing out of the ordinary for a Central London rooftop bar. The ambience is chilled and I like that the clientele is a real mix of age and types.